It’s no surprise that one of my favorite chefs, Mario Batali, helped open The Spotted Pig in the West Village. 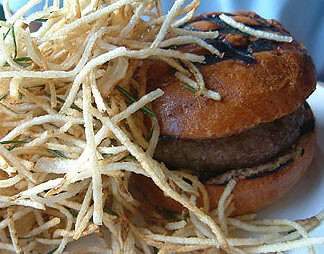 One look at the menu and a wanna-be foodie like me would immediately appreciate the tongue and the kidney, two items that are almost always expected in a restaurant that calls itself a “gastro-pub.” The chargrilled burger with roquefort cheese and shoestring fries in garlic and rosemary is a must-try. Order it meat medium-rare and I can bet it will satisy the carnivore in you, even if you don’t like stinky cheese. During my first visit, I ordered the ramps and they came wrapped in pancetta. It’s pretty steep at $14 but if you like ramps in the spring like I do, it’s an appetizer you can’t skip. I also had the rabbit cooked with fiddlehead ferns, a vegetable also only available in the spring. With two of my favorite vegetables on the same menu at the same night, I swore I would return. 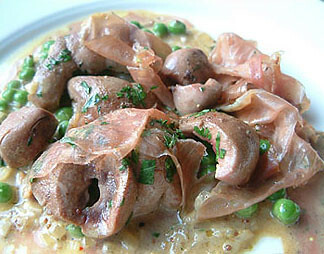 When I finally did, I ordered the poached lamb’s tongue and the pan-fried veal kidney. 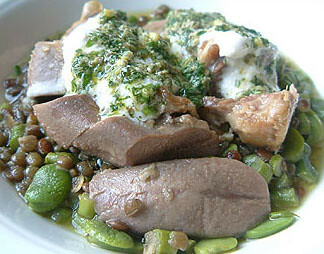 The tongue was served with lentils and fava beans. The tarragon plus the sour cream gave the dish a little kick and they helped melt the tongue in my, well, tongue. Even though several pieces of the tongue were sliced, I could not help but notice that one was actually a whole piece. It looked like the lamb went Maaah and then the whoosh of the butcher’s knife just sliced it. It made for interesting photo anyway. The veal kidney was a little too overwhelming. I understood that another strong ingredient was needed to bring out the offal taste of the kidneys, but I thought prosciutto and mustard sauce were too salty to complement them. The combination was so powerful that they were all competing in my mouth. And this is when the pub’s role comes in. The Spotted Pig has about one hundred different bottles of wine on their list, together with a few pale ales and stouts. Hand-pumped Old Speckled Hen comes in handy with all that offal. Visit on a weeknight and expect to wait for an hour. Visit on a weekend and expect to wait for two hours. Everyone in New York City wants to be at the Pig. they must have a seasonal menu (nice) because none of the stuff you ate, they had last night. crispy pig ear salad? strange, but I couldn’t stop eating it. I was looking for the tongue and kidney dish above, to no avail. decent grub, but too heavy and rich for me. good veg tho.